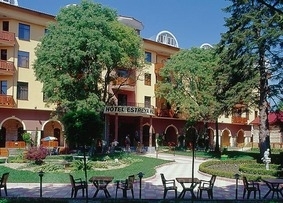 Location: LTI Estreya Palace Hotel is located in the heart of the health resort of St. St. Constantine and Elena. Accommodation: Each double room includes the following amenities: shower cabin (bathtub) and hairdryer, terrace, air-conditioning, phone, satelite TV and mini bar. Each of the apartment-suites comprises two rooms - bedroom and living room with furniture. They are furbished with: shower cabin (bathtub) and hairdryer, terrace, air-conditioning, phone, satellite TV, mini bar. Spa & Wellness: The spa centre offers a variety of massages, shiatzu, mud healing, lugatherapy, facial procedures and rehabilitation procedures. Swimming pool, sauna, steam bath, Jacuzzi and relax room at guests' disposal. The combination of picturesque woods and calm beaches ensures the guests of LTI Estreya Palace Hotel a delightful, unforgettable holiday experience.